Today I wanted to show you an easy way to make two ice cream cones for your dolls. Step 1- Use your ruler to measure from one corner of your felt 2 inches. 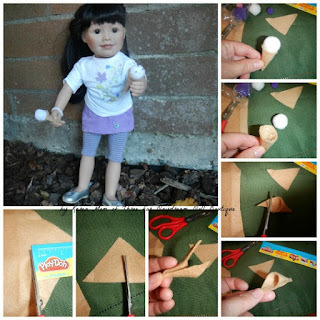 Cut a straight line across your felt where the 2 inch mark is. You will now have a triangle. Step 2- Cut your Triangle in half up the middle as shown in the photo above. You now will have two triangles; these will be your cones. Step 3- Start rolling a cone shape as shown above, as you roll add a line of glue or use your glue dots to hold the cones shape. Step 5- Place a line of glue inside your cone (or add more glue dots) and place your pompom scoop of ice cream into place. Let dry. 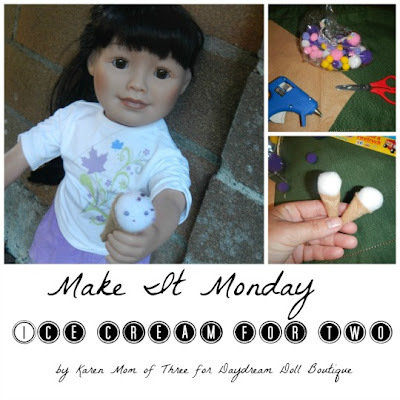 Step 6- If you wish your ice cream cone to have sprinkles use small colorful seed beads, add some glue to your pompom and sprinkle the seeds over the glue. Step 7- Repeat Steps 3-6. 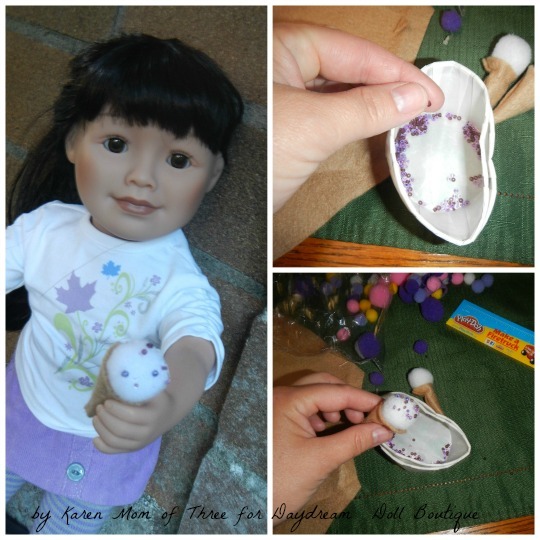 Let dry, then place the ice cream cones in your dolls hands.